From July 1989: The half-page UK print ad for the third installment in THE KARATE KID sequence of films. The first appeared in the summer of 1984 with the sequel hitting two years later. 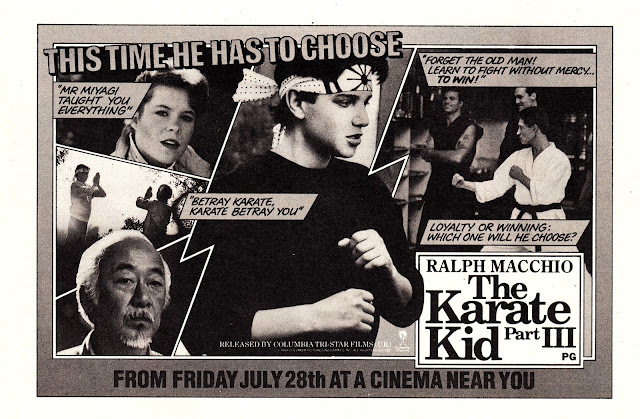 Perennial teen Ralph Macchio (a revelation in THE OUTSIDERS) would have been aged circa 28 (born 1961) by the time he finished shooting this... so the next outing in the run (1994's THE NEXT KARATE KID) dispensed with his services, retained Pat Morita and added Hilary Swank and Michael Ironside to the mix. There was also a thirteen episode animated series aired on NBC in 1989 and a movie remake in 2010.